A scarf to wear for life. The Tree of Life art glass pattern, so identifiable with Wright and the Martin House, runs the length of this 49" x 11", 100% silk scarf. One of our most popular items - we see it show up wherever women are looking good. 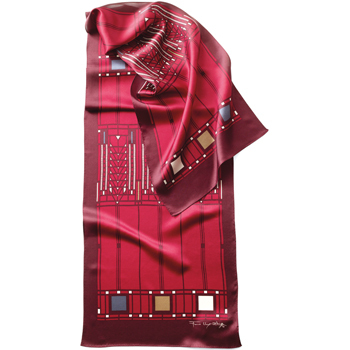 In red or black as the primary color - both scarves are fundamental additions to your wardrobe.